Our Marina is constructed of state-of-the-art, extruded aluminum and is not like any other marina on The Hudson River. Our wave attenuator is a device designed to reduce the power of a wave. 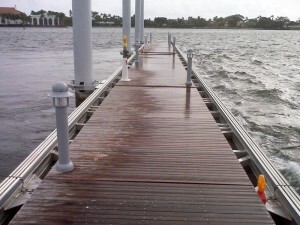 It is used for keeping the boats protected from river waves, aggressive wake and debris. It will help minimize your boat from colliding into the dock and other boats. Click on the wave attenuator image to enlarge. This image shows the waves coming in on the right and the attenuator reducing them to almost nothing on the left.